Contrary to what you might think, cheese isn’t entirely off the table for people with lactose intolerance. Cheese is what’s produced when milk is fermented using microbial cultures and an enzyme called rennet. Those microbes snack on lactose, the sugar that’s in the milk, converting it into curds that are then packed to form cheese. 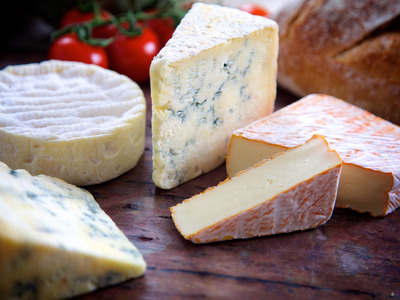 But, as part of the cheese-making process, some cheeses end up having more lactose than others. Michael Tunick, a research chemist at the U.S. Department of Agriculture and the author of “The Science of Cheese,” told Business Insider a helpful rule: The longer a cheese has aged, the more likely you can eat it if you’re lactose intolerant. “Starter culture bacteria consume the lactose in the cheese, so therefore if you have cheese that’s been aged any amount of time, that’s not going to have any lactose left in it — or very little,” Tunick said. An aged cheddar or parmesan, for example, should have very little lactose left in it, while feta has a fair amount. An easy way to vet a cheese is to look at the nutrition label — a cheese with little lactose in it will have very few grams of sugar, while one that’s high in lactose will have 5 grams or more.